Oh my, the days are flying, Christmas is almost upon us, the forests of Lamington National Park are thick with new growth, a new tent sits in its clearing and we haven’t posted on Nightfall’s blog for close to 12 months. How remiss. Where did the year go? What have we been up to at Nightfall? A bit of this and a bit of that, with lots in between to distract us from writing perhaps. We like to think it’s been a time of consolidation, with a few big steps along the way. February was cause for celebration when our good friend, the Australian journalist, Peter Greste was finally freed from jail in Cairo, after 400 days of wrongful detention by Egyptian authorities. If you stayed with us before that time, you might have inadvertently become part of Peter’s journey, as I took phone calls day and night, responded to emails and rushed off to host family press conferences. As Peter’s friend and a friend of the family, I (Heidi) ran the media campaign to secure his freedom, while Steve worked twice as hard to keep Nightfall on track. Over the year, we liaised with more than 350 journalists from around the world. It was grueling, challenging, exhausting and rewarding. Journalist Alice Gorman captured our campaign life well in this article. We often joke that Peter’s freedom was also our own … allowing us to finally focus wholeheartedly again on our Nightfall dream. 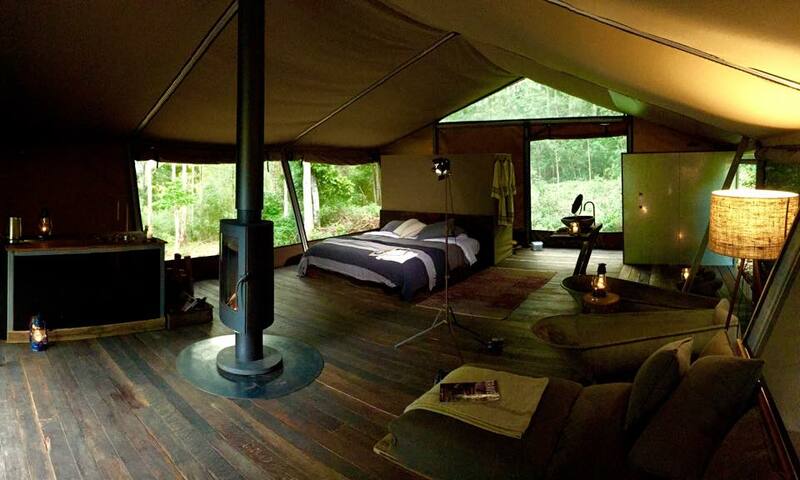 Working between guests, it took us until May to bring online Nightfall’s third glamping safari tent. Yes, more sewing for me; welding, landscaping and furniture building for Steve; and lots of decisions about furnishings and bedding. The results are worth every bit of the slaving on detail. 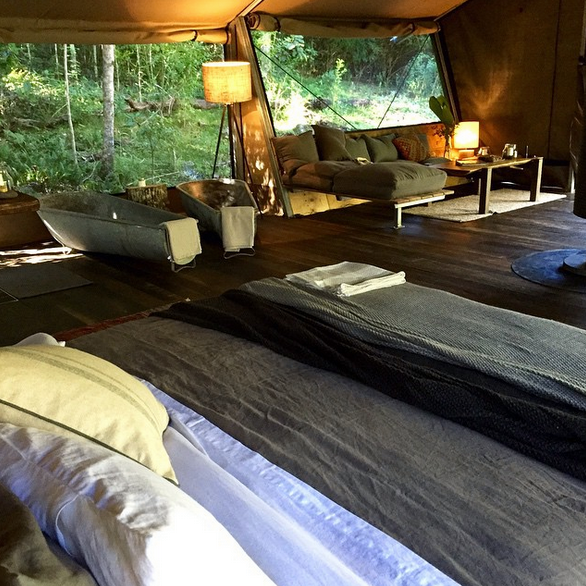 Since we opened the camp, guests have commented on the homely eclectic touches in our permanent tents. We love the evolution our our under-canvas accommodation, as we add to the layers of understated luxury — linen cushions from Reinventare, delightfully soft linen sheets from Cultiver, Scandinavian style towels from Linum and Luna Gallery’s delectable mohair blankets (fully machine washable and able to go in the dryer … revolutionary!). Nightfall’s camp lounge also evolved: a bit more timber here and there and canvas panels to close down the space in winter for cozy nights of stories and laughter at the shared Long Table, beside the open fire. Eight adults makes for a wonderful dinner party atmosphere. Now, as the days and nights warm, our thoughts return to the creek, with its cool waters and the opportunity to again create the romance and intimacy of Dining on the Rapids. Nothing beats the hypnotic sounds of tumbling waters, the flickering of kero lamps reflected in the flowing stream and time with your lover. The days are also now warm enough for massages and personal yoga sessions on the creek. 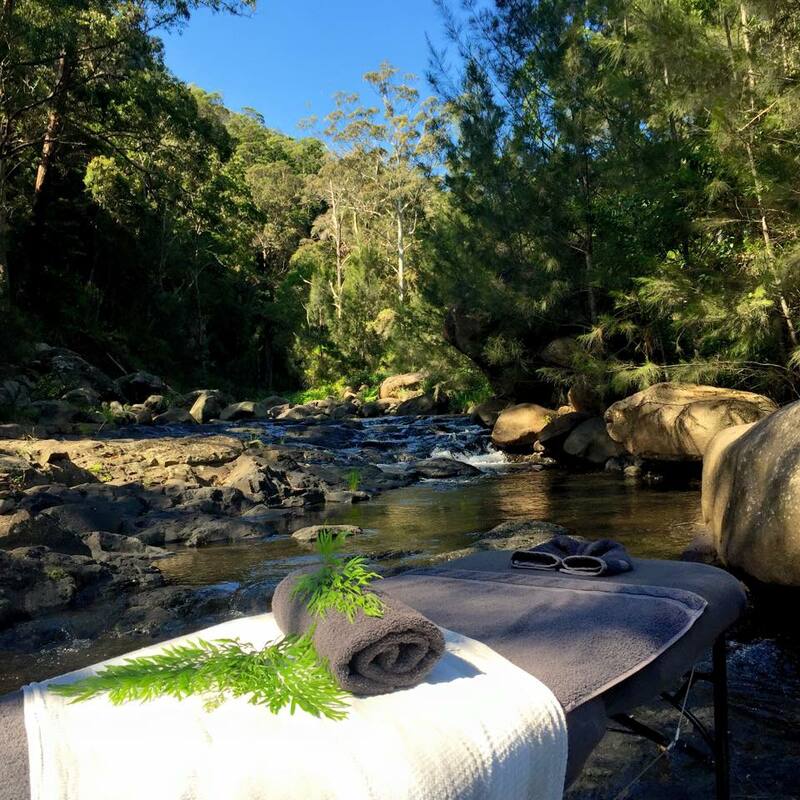 Nightfall’s therapist Kara Swift is passionate about organic product – her facials and massages are a favourite way to rejuvenate as you soak up the sounds and magic of our wilderness. So what lies ahead for the next few months? A full house … what’s new! Yes, we’re sad many of you who’re choosing to return are finding you can’t get in for months. We currently turn away more guests than we’re able to accommodate. Yes, we could build more tents, but then we ask ourselves what is it about Nightfall that’s special. In part it’s the intimacy of the experience, so no, we won’t be adding a host more tents. Instead we promise to become better at reminding you to book ahead. We have also realised a need to refine Nightfall, so Steve and I actually get at least one day off each week. We need to tame our galloping juggernaut, so Nightfall does become the centrepiece of our genuinely sustainable life. From March 2016, we have tweaked our format, creating Nightfall’s new Ultimate Weekend Retreat – arrive mid Friday and don’t leave until Sunday afternoon (none of those uncomfortable 10am departures!). We believe those extra hours will add to the feeling of an extended break. Add an open bar, a myriad more little touches and a three-night Ultimate Long Weekend option each month … but more of all that in our next blog.